Valve have expanded their VR support, with the introduction of their SteamVR Input system which is very much like what they've done for gamepads in the main Steam client. 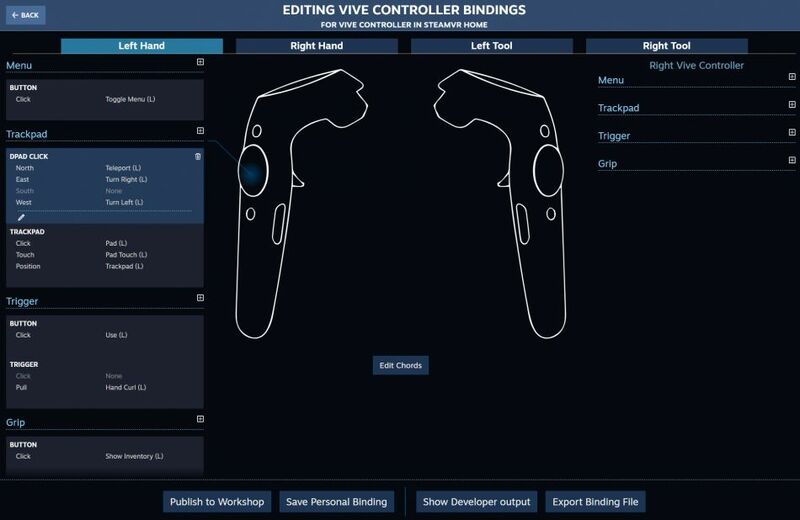 SteamVR Input allows users to build binding configurations for their favorite games, even for controllers that didn't exist when the game was written. They can adapt the controls of games to take left-handedness, a disability, or just personal preference into account. And once they build a configuration they can share them easily with other users of the same game via the Steam Workshop. This new input system also allows developers to adapt their games more easily to diverse controllers. Developers control the default bindings for each controller type, and can offer alternate control schemes directly without the need to change the games themselves. When using SteamVR Input, developers expose high level "actions" in their applications that control how the binding UI presents their game to users. It's built into SteamVR, so it allows people to adjust it in-headset so you don't need to mess about with anything outside of the VR experience, which sounds nice. It's great to see Valve make more steps like this, offering users and developers more options is great. When I eventually get a Vive, things might be in great shape. Just need the price to come down a bit more, still crazy expensive. For those that do own a VR headset and use it on Linux, do share your up to date experiences in the comments, would love to hear about it. Thanks for the tip, Andreas! Liam, after the new Vive sets came the prices on the old Vive model have dropped like a rock on the second hand market, here in Norway at least. So well worth keeping an eye on! I need to upgrade my PC before I can think of attaching a VR set, but plan to do so once the next generation Nvidia are out, rumoured to be this July. I hope for a price drop on the 1080 then. I've checked ebay myself, they all still seem to go up to around £400. I will probably have to wait until a while after the newer model is released for the prices to come down more then. Does this work with Samsung Odyssey? I've ordered one from US and wonder if all works on Ubuntu. Should do with OpenXR later this year? I was originally waiting for the Vive Pro to come out but price/reward ratio isn't that good for a resolution increase.. Really want to try out the HDK2 but it hasn't been updated or anything, there's also a few places where it could be improved with a refresh. Which HMD works best under Linux? Bigger problem you'll run into is hardware support... from HTC / Valve. It doesn't exist. At least they've outsourced everything to some Asian country it's completely useless. I'm told the Pro has better video but I'll never buy another Vive. Fun fact, I've had mine for less then six months and the batteries are already having problems holding charge. devnull Fun fact, I've had mine for less then six months and the batteries are already having problems holding charge. Batteries, where? The controllers? Are they not replaceable? The controllers yes. Technically they should be replaceable but voids your warranty outside jurisdictions with right to repair laws. I don't know what the shape of them are either, guessing they aren't standard so logistically it may not be possible. Certainly not a simple battery compartment that opens which given the use case seems rather retarded. Watch the VR streamers on Twitch and you'll see they all go through the same problems. Some of them happen at weird intervals like the track pad not working or USB ports wearing out.